â€ Colony Forming Units at time of manufacture. 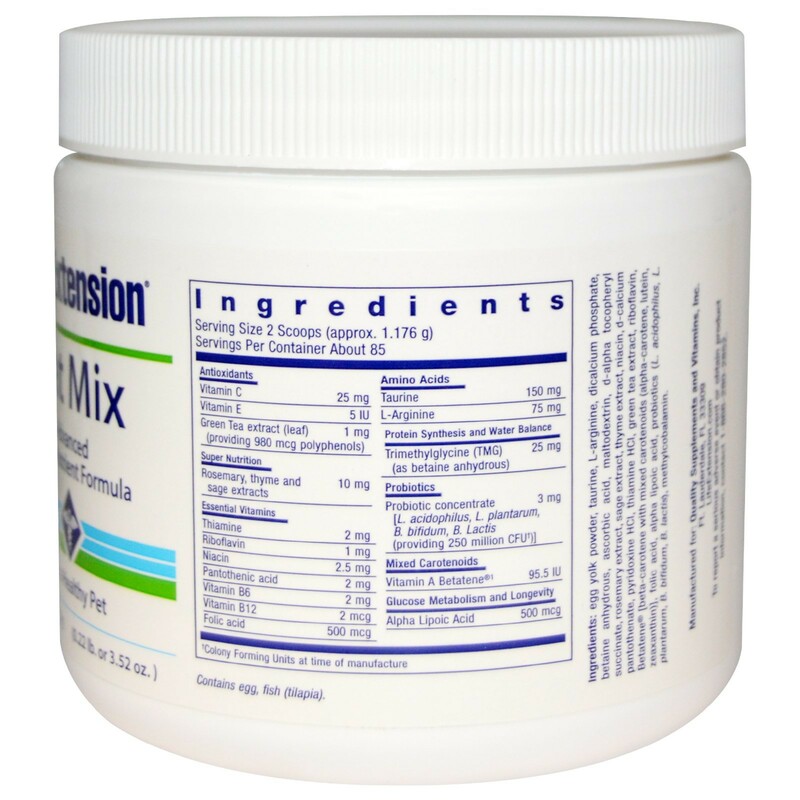 Egg yolk powder, taurine, L-arginine, dicalcium phosphate, betaine anhydrous, ascorbic acid, maltodextrin, d-alpha tocopheryl succinate, rosemary extract, sage extract, thyme extract, niacin, d-calcium pantothante, pyridoxine HCI, thiamine HCI, green tea extract, riboflavin, betatene (beta-carotene with mixed carotenoids (alpha-carotene, lutein, zeaxanthin), folic acid, alpha lipoic acid, probiotics (L.acidophilus, L. plantarum, B. bifidum, B. Lactis), methylcobalamin. Contains egg, fish (tilapia). Animals have unique physiological and structural systems and, therefore, need specific food and nutrients to remain in optimal health. No longer insignificant, household pets are now considered family members who require special attention. Filling the need, the pet food industry has grown tremendously over the years. But you have to wonder if you are getting the best nutrients for your cat. Cats have been domesticated since early times to catch rats and mice. Today, they are primarily household pets that, like dogs, require special attention when it comes to nutrition and care. Cats are carnivorous. But unlike dogs that can eat some plant-based foods, cats need animal protein to survive. Nutrients like taurine and arginine are important to a cat's health, and without them cats could die. Taurine, for cats, is a must for heart, kidney, and eye health. Arginine detoxifies ammonia in cat's kidneys and is also important for heart and pancreatic function and keeping the gut healthy. Arachidonic acid is an essential fatty acid for cats, since cats cannot convert significant quantities of linoleate to arachidonate. And, just like humans, cats need B vitamins to support the cardiovascular system. Cats also have problems metabolizing certain amino acids from other nutrients, like the conversion of niacin from tryptophan, or vitamin A from beta carotene. For that reason cats have more stringent nutritional requirements than such omnivores as dogs and humans. So how can you be sure that you are giving your pet the best nutrition? Besides high-quality commercial foods that are nutrient-enriched, food supplements are the best way to ensure your pets are getting all the vitamins and minerals they need to live long healthy lives. 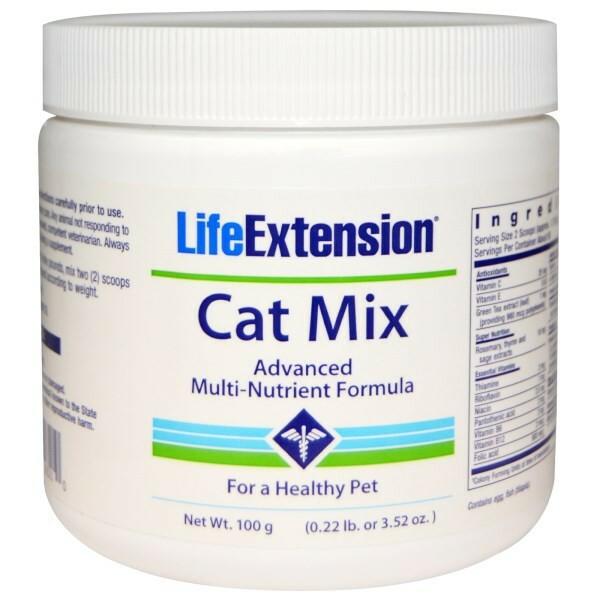 Life Extension's Cat Mix is among the best products for protecting your pet's health. Just two scoops per day provide the vitamins your pet needs to stay healthy and strong. 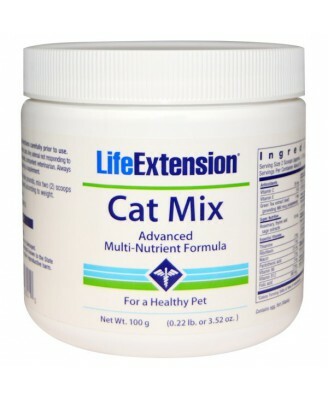 Cat Mix contains significant amounts of high-grade nutrients usually reserved for the most expensive human supplements. It contains flavonoids, amino acids, antioxidants, probiotics, essential fatty acids, methylation enhancers, and more. In fact, many commercial pet foods do not contain the vitamins, amino acids, phytonutrients, and advanced antioxidants found in Cat Mix. 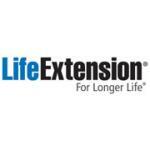 Life Extension pet supplements contain the same premium-grade nutrients used in all of our products. Read the entire label and follow the directions carefully prior to use. For cats weighing six to nine pounds, mix two (2) scoops a day into your pet's food. Adjust amount according to weight. Refrigerate after opening. Density may vary. This product is not meant to replace veterinary care. Any animal not responding to nutritional therapy should be seen by a licensed, competent veterinarian. Always inform your veterinarian if your animal is taking a supplement. Keep out of reach of children. Do not exceed recommended dose.